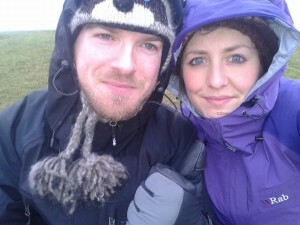 Mt Kilimanjaro trek will be a late honeymoon for newly-wed Frome couple! Charlotte and David in training. A FROME couple are putting the finishing touches to their training programme in readiness for a fundraising hike up Mt Kilimanjaro in Tanzania which doubles up as their honeymoon! Charlotte Smith and her husband David, who married in July last year, had asked wedding guests to gift money instead of presents to fund the flights to the iconic mountain. They will leave the UK next month and will be trekking for 10 days. Charlotte chose Dorothy House in memory of Maggie Landry, the deputy head of Sutton Veny C of E Primary School where Charlotte works. Fortunately Charlotte and David both love the outdoors, which has helped with their training. The pair have been biking and walking in Wales and before that, walked the South West Coastline for five days. More recently Charlotte has been running up Cley Hill near Sutton Veny, attending Pilates classes and playing hockey for Frome Ladies 2nd team. Charlotte says the school has been really supportive by helping with fundraising. The school council has helped run events including a ‘table top fundraiser’ that raised over £500. Later this month Charlotte and her colleagues will be doing some ‘bag packing’ at Waitrose in Warminster to raise extra funds.